I've been getting 3B Box for just over half a year now and I can honestly say that I'm so glad I signed up. It's true that I haven't loved everything from the boxes, but you do get a chance to try lots of fun stuff (one of them is in this month's bag!) and I've found several new favorites through this subscription. Skinfood My Shortcake Setting Mascara (7g approx value: $3) - Mascara. Meh. I like the Skin Food brand but I'm trying to thin out my mascara drawer. Yep, I have an entire mini-drawer of them. I don't even use it regularly so why do I have so many? The world (and I) may never know. CosRx Blackhead Silk Finger Balls (12ct value: $5) - I heard of these a while back and thought they were the coolest weird things ever. 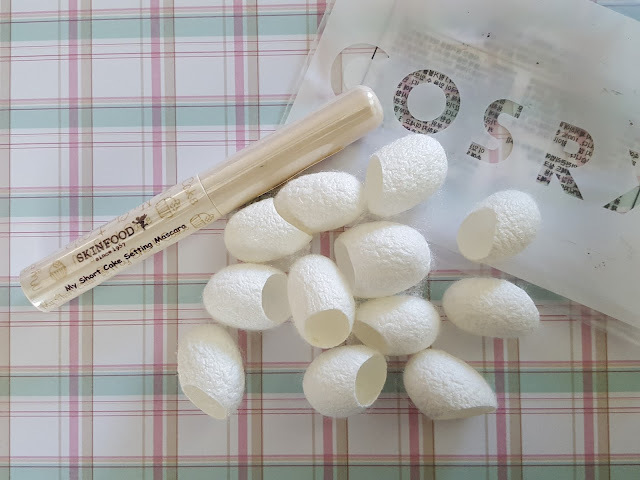 And I'm SO happy to finally have my own silkworm cocoon pods to use at my disposal. Even if it turns out they don't remove my blackheads (nothing short of a good ol' nose strip has ever worked for me) I hear they leave your skin suuuper smooth. Can't wait to try! Dermal Dream Sea Cucumber Supreme Mask (Value: $1) - Well this is new. I've never put sea cucumber on my face before. To tell you the truth, I'm kinda freaking out about it as much as when I first heard that you can put snail on your face. Because sea cucumbers are so squishy just like snails. I'd probably hug a sea cucumber before I'd touch a snail, though. This sheet mask is rich in collagen, arginine, alanine, taurine, and a slew of minerals that fight aging and brighten up skin. And of course it also has refined sea cucumber serum. Is that the stringy white goo they shoot out? 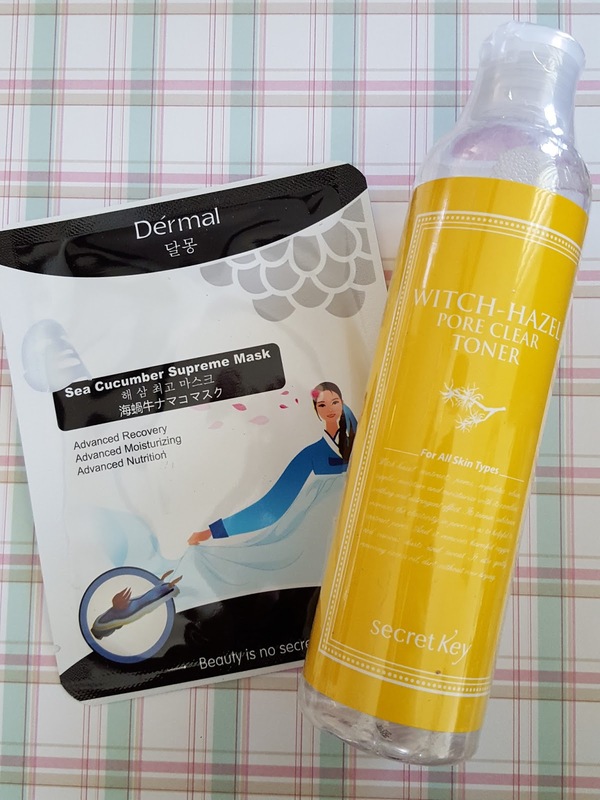 Secret Key Witch Hazel Pore Clear Toner (248ml full size value: $10) - Witch hazel is a terrific astringent and works well for acne-prone skin. It's also an anti-inflammatory and might help soothe those blemishes. Some people (i.e.those who suffer from rosacea) might be sensitive to witch hazel but I personally have had no issues with it. And this is a huge full size bottle that I'm looking forward to using up! Yay! Two things I'm excited about and one that's undeniably intriguing...sea cucumber??? 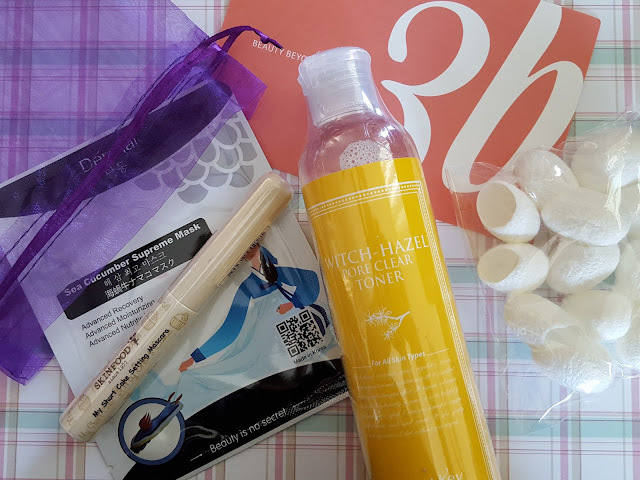 Yup, I'd say 3B nailed it this month with the Asian beauty novelty factor. I'm giggling just picturing the look on my husband's face when he finds out I just wiped my face with cocoons and sea cucumbers. Click here to sign up now for the wait list! The sooner you get on, the sooner you can get off and join the fun :) You won't get charged for your first box until you move off the list.